Bling, Bling, BLING! You asked for some glitter, and Maybelline India listened. They have introduced 8 sparkly friends to the Color Show gang. Makes me think - Waldorfs & van der Woodsens..... Humphreys. Maybelline Color Show GLITTER MANIA Starry Nights ~ Like a black diamond in the rough. This is one shade from the range that could look both Emmy Awards & Rock Concert. I applied 2 coats here. 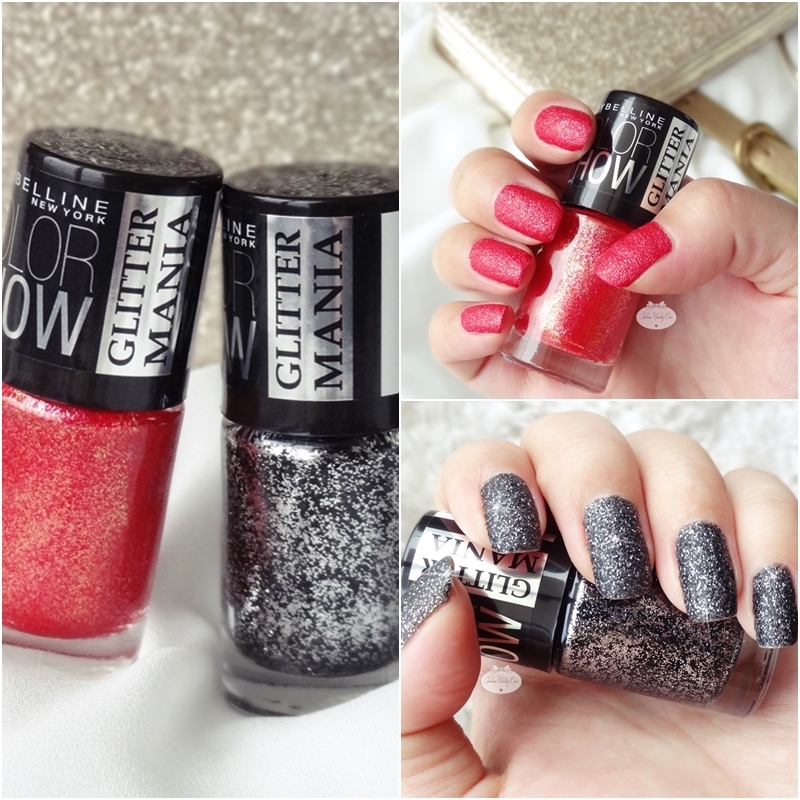 Maybelline Color Show GLITTER MANIA Red Carpet ~ If Starry Nights is glittery, this has more of a sandy texture. Less sparkly, but still shimmery. It is also thicker in consistency. 1 coat is all you need, although it takes 2 coats to make it look red. With 1 coat, it looks pinker. Paparazzi Purple, Starry Nights, Pink Champagne, Bling On the Blue, All That Glitters, Matinee Mauve, Dazzling Diva, Red Carpet. Price: Rs.125, each. Only 50 rupees more than the original Color Show Nail Polishes. If you haven't seen my swatches of the regular Color Show range, please go HERE & HERE. Have you girls picked these up yet? starry nights is such a pretty color! I really like the look of Starry Nights but I hate removing formulas like that! I love both the colors!! I bought exactly these two colours, and I also wanted to buy All that glitters, and it was out of stock. I like the sandy/gritty finish that the nail paint gives.. Although I love wearing glitter nail polish, removing it is a pain, but I found an easy way out that works all the time and just blogged about it, so that I could share it with everyone. Do check it out. I bought Starry night, pink champagne and loved these. starry nights and red carpet looks awesome.